Easy grilled soft shell crabs and Rob’s “famous” Slaw made with the seemingly everlasting red and green cabbages, a favorite of mine, but I took out the last bowl of chili for Michael…this crazy non-beach wintry weather is perfect for long-lost comfort food dinners so I have to say, comfort to me the soft shells and to Mike, the chili. Everybody is happy. I used a grill pan yesterday for 2 truly grill weather soft shells a quick “Halo” marinade and a brief sauté , layered over the slaw and served with halo segments and lemon. 1. Rinse and pat dry cleaned crabs and place them in a bowl. Add the rest of the ingredients except lemon juice and mix well, making sure the crabs are well-coated. Reserve some parsley for garnish. 2. 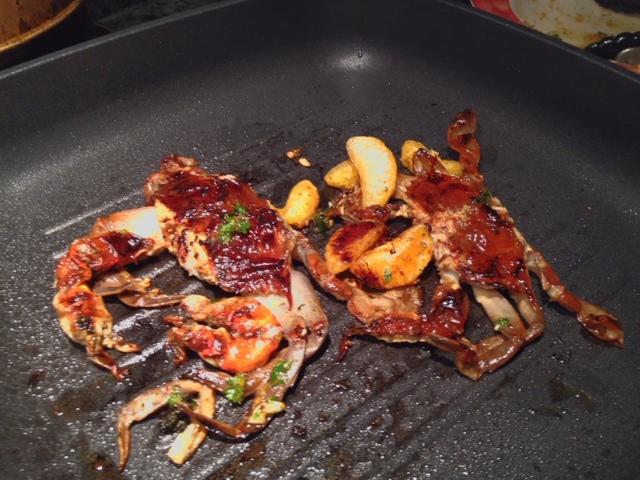 Heat a grill, grill pan, When the grill pan is hot add the crabs and cook 3-4 minutes per side, turning once and basting with the oil mixture that was left in the bowl. 3. Remove to a serving dish and top with more parsley and the lemon juice.